Newly elected Republican Gov. Ron DeSantis indicated he would sign legislation banning fracking in the Sunshine State. Although his announcement has garnered approval from such fringe environmental groups as Food and Water Watch, it should alarm consumers and businesses alike: While fracking doesn’t actually take place in Florida, the proposed legislation goes far beyond fracking. It would also ban conventional acid treatment, which is a technique that has been used safely in Florida for decades. The proposed legislation would cripple, if not eliminate, the state’s conventional oil and gas industry and do nothing to achieve the governor’s environmental goals. DeSantis recently signed an executive order on major water policy reforms, including investing in Everglades restoration and water protection, mitigating algae blooms, and creating several new regulatory offices focused on environmental stewardship. And on the same day the governor was announcing his new initiatives, bipartisan legislation was introduced in both houses of the Florida legislature that would ban “advanced well stimulation treatment” of oil and gas wells. Never mind that the state’s water is not threatened by these techniques. For the past several years, politicians of both parties have pursued legislation that would effectively kill Florida’s energy industry under the guise of attempting to “ban” non-existent fracking. With such titles as “Prohibition Against Hydraulic Fracturing and Other Forms of Well Stimulation,” “Advanced Well Stimulation Treatment,” “Regulation of Oil and Gas Resources,” and “Oil and Natural Gas Production or Recovery,” these measures would have banned well-stimulation and oil-and-gas recovery techniques – most importantly, conventional acid-treatment – that have been used safely for 70 years and are critical to keeping Florida’s oil industry productive and compliant. (a) At a pressure that is at or exceeds the fracture gradient of the rock formation and that has the purpose or effect of fracturing the formation to increase production or recovery from an oil or gas well, such as hydraulic fracturing or acid fracturing. 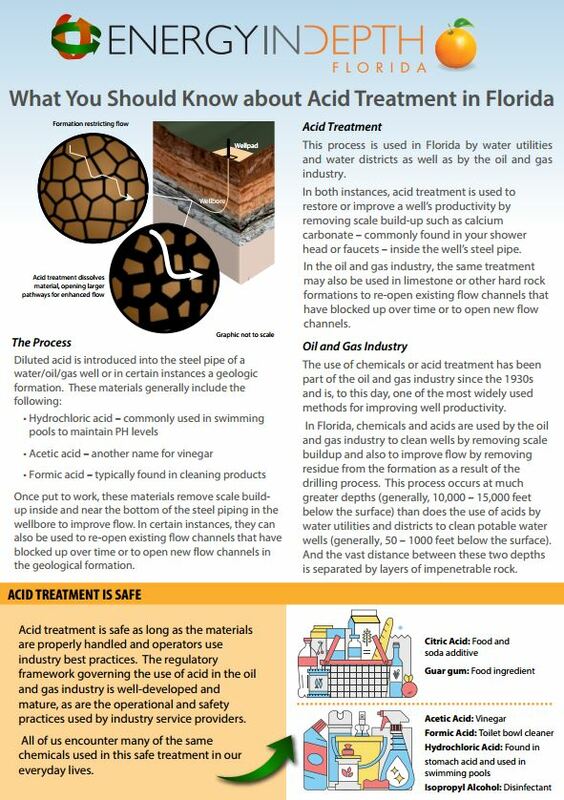 As EID has explained previously, matrix acidizing is a common and well-understood technique absolutely critical to the maintenance and stimulation of not only Florida’s oil and gas wells but the state’s water wells, too. These proposals provide a critical reminder of why environmental policy must focus on real solutions to real problems, rather than on inadvertently (or intentionally) banning a 70-year old industry responsible for hundreds of thousands of direct and indirect jobs, $10 million in severance and property taxes, and an environmental record to be proud of.